The Ultima Six Speed Builders kit was designed to provide a simple, low cost, 6 speed overdrive solution for 1990 - up Big twin owners. These kits work in most 1990-1999 models with little or no modification. A speedometer recalibration unit is required on some 1996-2000 and all 2001 later models. These kits will work in 5 speed type 2000 - Later models with additional minor modifications. The trap door is thicker than stock so any brackets used that are trap door mounted may need modification. Complete instructions included or available online. All Touring FLT and FLH Models 1993 - later require an oil filler spacer #89-14. 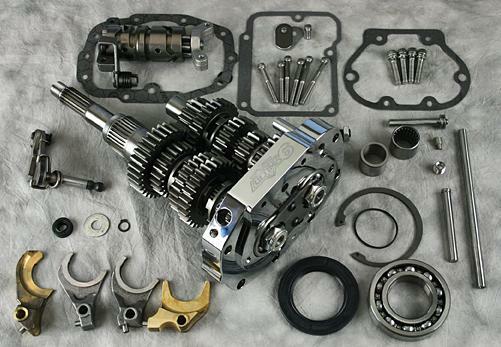 Ultima 6 Speed Gear sets are the same ones used in our transmissions and are great value products .